Buenos dias, everyone! Today I’m sharing a favourite recipe with you with this Avocado Pasta Sauce! Because: Surprise Surprise – avocado is not only amazing on bread! Though I absolutely love it on bread – if I had to choose my last meal ever, avocado toast would definitely rank high in the list of items I’d consider – alongside grilled avocado cheese toast (ooh it’s heavenly!) but let’s leave that recipe for another time. Today I’m bringing you this super creamy, tasty and quick avocado pasta sauce recipe! I have to admit, this was the first ever time that I tried out making a pasta sauce from avocados – and I honestly can’t wait for the next time, it’s soooo super creamy and if you love avocado, you’ll surely get addicted to this recipe also. Shelled pasta worked perfectly with the avocado pasta sauce, I simply love how it catches a little extra load of the sauce – but feel free to replace it with your favourite pasta or simply what you have on hand. I can imagine that it would go well with Penne or Fusilli. 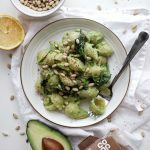 The avocado pasta sauce along with the pine nut topping is absolutely great for vegan keto! Simply replace the wheat pasta with a low carb option, zero pasta or zoodles! 2. Remove the stones from the avocados, scoop out the flesh and mash well. Stir through the olive oil and lemon juice. 3. Put the washed spinach into a colander. Set 2-3 tablespoons of the pasta water aside and strain the cooked pasta through the colander. This will automatically cook the spinach without overcooking it. 4. Stir the pasta, spinach, reserved pasta water and avocado pasta sauce together in a pan, until the pasta is well coated. 5. 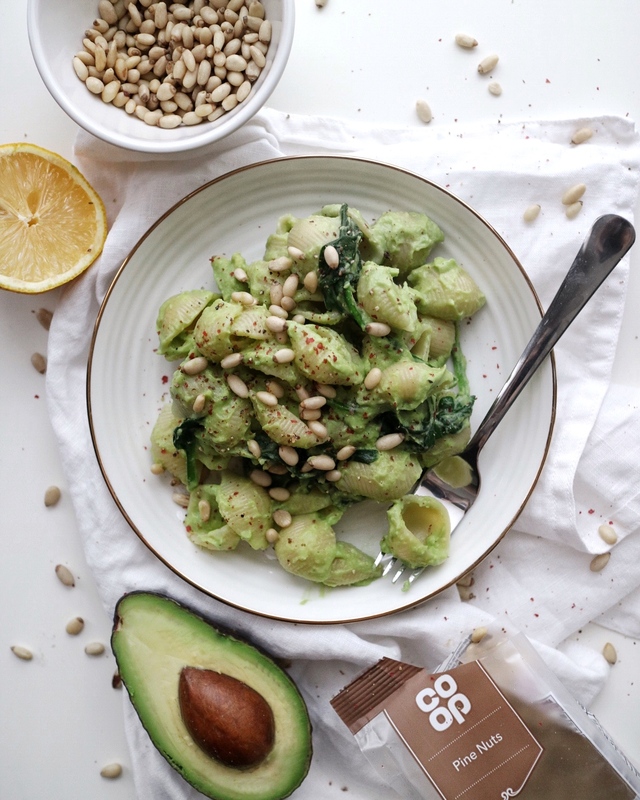 Serve sprinkled with the toasted pine nuts and season with salt & pepper to your liking and your pasta with deliciously creamy vegan avocado pasta sauce is ready! As you may know avocado goes dark when left in the open, so I recommend serving this recipe instantly. Due to the nature of the dish, it is not suitable for lunchboxes I’m afraid. But you can always precook the pasta and mix the sauce ingredients together during lunch – if you have the option on the go or at work. And the result is this super creamy pasta! Now, as you may know avocado goes dark when left in the open, so I recommend serving this recipe instantly. Due to the nature of the dish, it is not suitable for lunchboxes I’m afraid. But you can always precook the pasta and mix the sauce ingredients together during lunch – if you have the option on the go or at work.